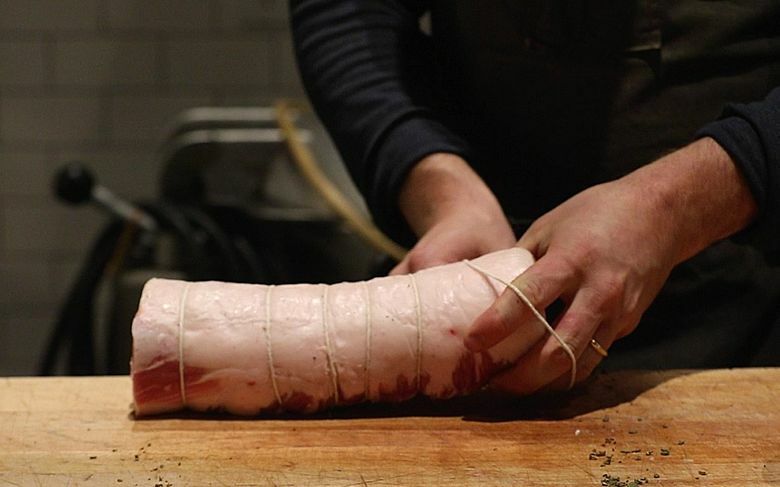 Update the holiday classic with a moist, tender, sage-stuffed pork loin. THIS IS NOT the pork roast you remember. Gone are the days, thankfully, when we cooked pork to 160 degrees. Done right, a pork roast is tender and tasty, moist inside, with a nice crisp exterior. 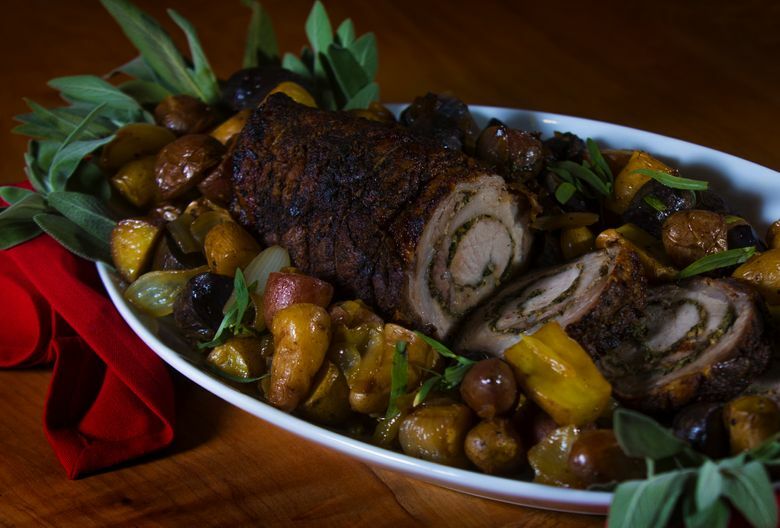 For those who eat pork, an herb-stuffed loin roast makes a nice holiday centerpiece. All that’s required is excellent pork, a good thermometer and a little bit of technique. Let’s start with the pig. Pork products vary wildly depending on how the pigs are raised, and what they eat. 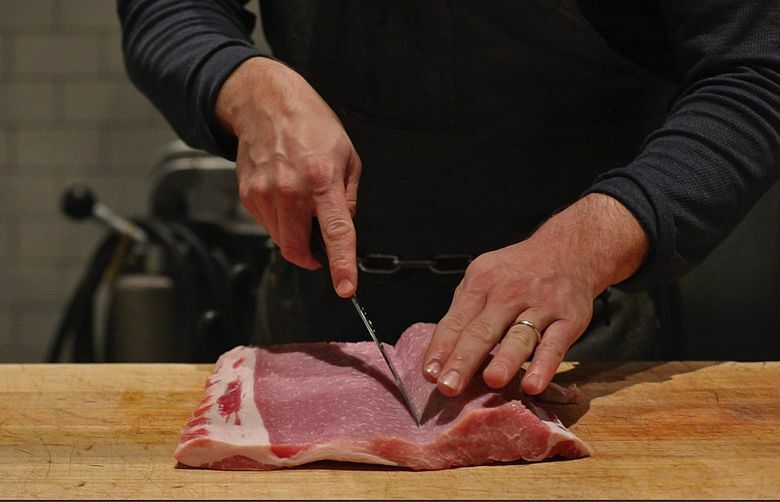 Russ Flint, owner of Rain Shadow Meats in Seattle, recommends all-natural pork from Northwest artisans like Tails & Trotters and Carlton Farms. Raising hogs in Ephrata, Tails & Trotters uses a “finishing program” inspired by the European tradition of letting pigs roam in oak forests, eating acorns. Owner Aaron Silverman researched using acorns but couldn’t find a consistent supply. So he turned to hazelnuts. The last 60 to 120 days before processing, Silverman’s pigs eat Oregon hazelnuts in addition to their usual diet of Washington wheat, oats, rye, flax and field peas. The pigs eat naturally and locally. 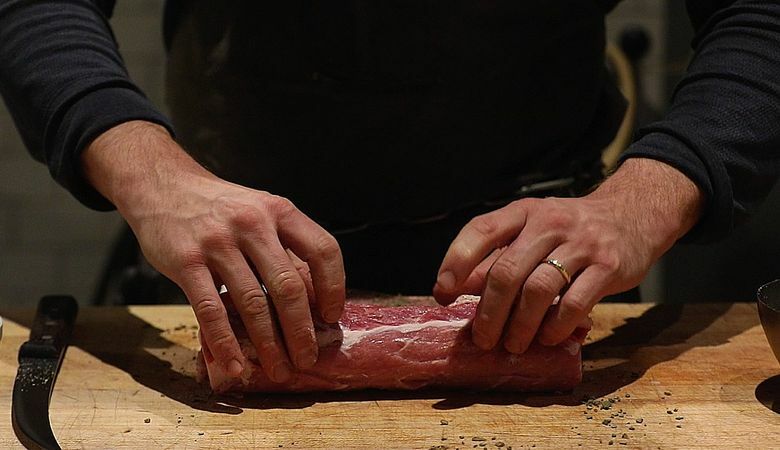 Once you’ve found your pork, ask for a 3-pound boneless loin roast butterflied all the way out to a uniform thickness. (At home, you might need to pound it if it’s not an even thickness, in order to get that perfect green spiral of sage rub.) Request that at least ¼-inch of fat remain, for flavor. Cultural or family traditions often dictate whether the skin is left on. If you choose skin, opt for a slightly larger roast. During the holidays, a crackling, crunchy outer layer can be a special addition. 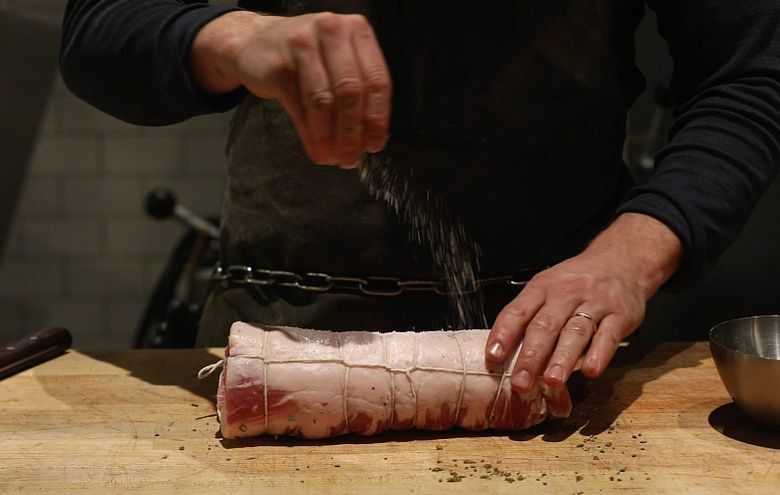 For seasoning, Flint suggests a simple sage rub like in the porchetta he serves at his shops. Most important, he says, pull the roast from the oven at 135 degrees, or it will be tough and dry. With the quality of artisan pork available today, and lower recommended cooking temperatures, it’s time to give the loin roast another chance. 2. Place sage and garlic in the bowl of a food processor, and process until finely chopped. Add ground fennel and black pepper, and pulse just to mix. 3. Unroll pork roast with inside of loin facing up. 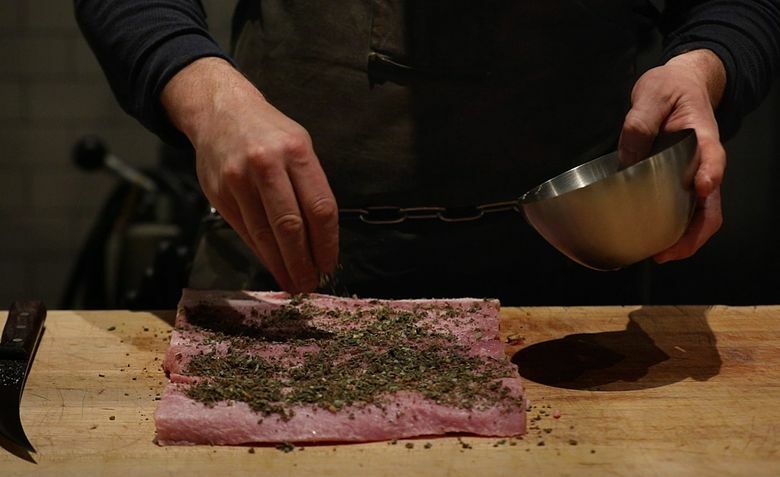 Season with kosher salt, then sprinkle on sage mixture evenly. 4. 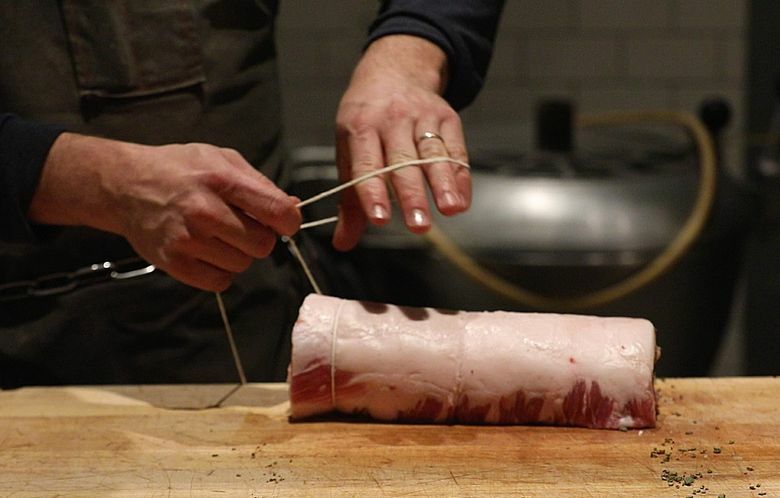 Roll the roast like a jelly roll, and tie with twine at least 4 times. 5. Coat the outside of the roast with olive oil, and season with salt and pepper. 6. Add remaining olive oil to a 12-inch cast-iron or other thick-bottomed, ovenproof pan. Heat on medium high until the oil just starts to smoke. Add the pork loin, and brown on all sides, about 2 to 3 minutes per side. 7. Add lemon halves to the pan, and place in oven. 8. Roast initially for about 40 minutes and, with an instant-read thermometer, take the internal temperature of the roast. Continue to check temperature until it reaches 135 degrees in the center. Do not overcook. 9. Remove from oven, and let rest for at least 10 minutes. The temperature will increase a few degrees as it rests. 10. 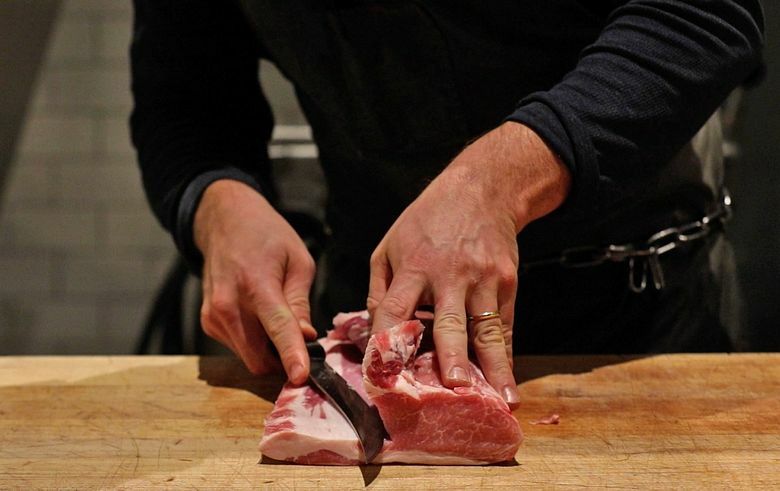 Remove twine, and slice pork in ½-inch slices. Arrange on a platter with fingerling potatoes and pan sauce, if desired. Catherine M. Allchin is a Seattle food writer. Follow her at catherinemallchin.com. Ellen M. Banner is a Seattle Times staff photographer.